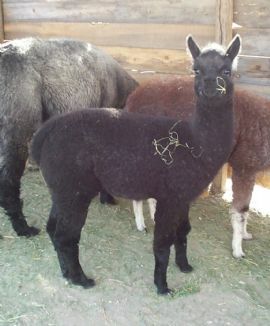 Midnight's Expresso is a lovely true black male out of Dom Lucilio and General Schwarzkopf bloodlines. He has perfect conformation as well as a strong presence. His fiber exhibits those notable qualities we're all looking for - good crimp, lustre, density and a fine handle. We expect Expresso to mature into an outstanding male that will enhance any breeding program by adding color and the quality traits of his strong heritage.